Gateway Metals, Inc. 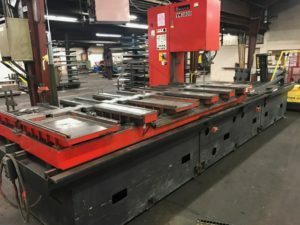 Adds Two Large Amada Saws, New Lighting, and Reorganizes Processing Facility | Gateway Metals, Inc.
Gateway Metals, Inc. has added two Amada saws to our cutting operation, added new overhead lighting, and reorganized our processing facility. 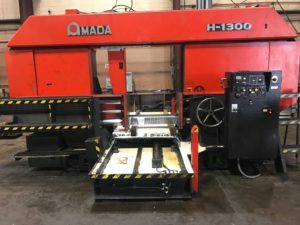 A large Amada H-1300 was purchased and installed in March 2017 making it the fourth large block saw in Gateway’s processing facility. This saw allows Gateway to cut large block up to 52″ tall and 52″ wide. A large Amada VM-3800 was purchased and installed in March 2017 making it the fifth plate saw in Gateway’s processing facility. This saw allows Gateway to cut up to 20″ thick plate and as wide a 31.5″ throat. New overhead lighting was also added in April 2017 to the processing facility. Gateway has added these items and continues to improve our facility with the ultimate goal of offering our customers more options and servicing our customers better.